8 Useful Features of your Smartphones you must know. In this fast pacing world, it is indeed a necessity already to have a mobile phone, or more likely even have a smartphone. Well, who doesn’t have one? I guess most of us have our own smartphones which are truly helpful, may it be for communication, entertainment, photography and data storage as well. It seems this have been also a requirement in our daily lives. But up to what extent do we know a lot about using our smartphones? 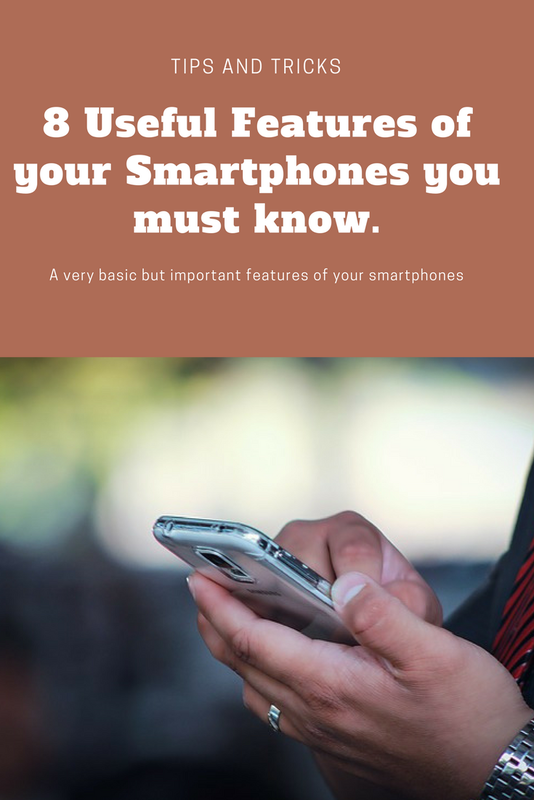 I bet not all of us are fund of checking in each parts, menus, applications and data on our phone, that’s why let me give you foretaste, tips and tricks of what are the other features of smartphones we have been using for long. 1. Identify where are all the battery charges are consumed. Well, we have already today power banks but of course, it still concerns us energy consumption of our phones. All major smartphones today have OSes who has thorough data and statistics of to what applications on your phone is consuming most of your battery charge. Through Setting apps, you can identify which app should remove (it’s your choice) or be used in a lesser time. 2. Speed up phone charging. Who wouldn’t want to have a speedy charging of our gadgets. Smartphones has its airplane mode menu and it that way, it will consume less of the battery and will be more quick in charging. On the other hand, it is still best advisable to charge our phones while turned off. 3. Block unwanted people. You may find this feature mean, but it is helpful. It is normal that we find some people annoying who texts or calls, and it’s unavoidable. You don’t have to change your number to get rid of them. In alert options, hit Priority and Settings part and there you can simply create a priority list of persons whose messages, calls and reminders can be received by your phone. 4. Automatically unlocking of your phone. Locking of our phones is inevitable when we are away from home, may it be when at school, office or at work. But when we’re at home, it seems too much to do to enter the password or swipe the code on our phone screens. We can easily set to automatically unlock our phones, simply go to Security, then Trust Agents, then Smart Lock. On this, you can simply input and set limitations on when will you be needing the password. 5. Extend battery life.In Settings, it has Battery control and Power Saver mode. This way, you can save and extend your battery into a certain percentage compared to its actual. It may reduce background features, turn off your usage of power-consuming applications and of using mobile data. 6. Keep stored things in private. There may be things in our phone that are only for us and that is expected already. But of course, we would need to keep it to ourselves no matter what, even though some might be trying to use our phones. To keep these kept, drag down the quick settings menu, and tap the user icon in the top part. There you can have ‘Add a guest’ and provide limitations that you will only allow to be viewed by others. 7. Control data usage. We want to save our data consumption and be used only on those that are important. By going to Data usage under Settings, you can set desired limits of usage of the data, a timeframe, and has also warning lines for its parameters. It also projects the data that you have already used that can be your reference. 8. Have a new and advanced keyboard. Most smartphones today have the third-party keyboards. It lets you have the auto-correct feature and add some emojis on the texts you’ll be creating. People have been fund to this nowadays. Check these features on your phone now and have fun using these from time to time. In the more years to come, we might experience more of the improved structures that smartphones can offer.